The UCA Core requires 38 credit hours at the lower division (LD Core). These courses include the 35 credit hour required state minimum core and one additional three credit hour course to satisfy the responsible living element in the UCA Core mission. The remaining 35 hours from the state minimum are distributed in the other knowledge and skills areas of critical inquiry, effective communication, and diversity. Embedded within the lower division is a first-year seminar (FYS). The first-year seminar comes from one of the lower-division academic courses. The purpose of the first-year seminar is to provide a small-class learning environment to facilitate engagement in academic study at the collegiate level, make a connection to the university, and reinforce the importance of communication skills. At the upper-division (UD Core), additional courses within the four knowledge and skills areas promote the development and application of knowledge and skills learned at the lower division. 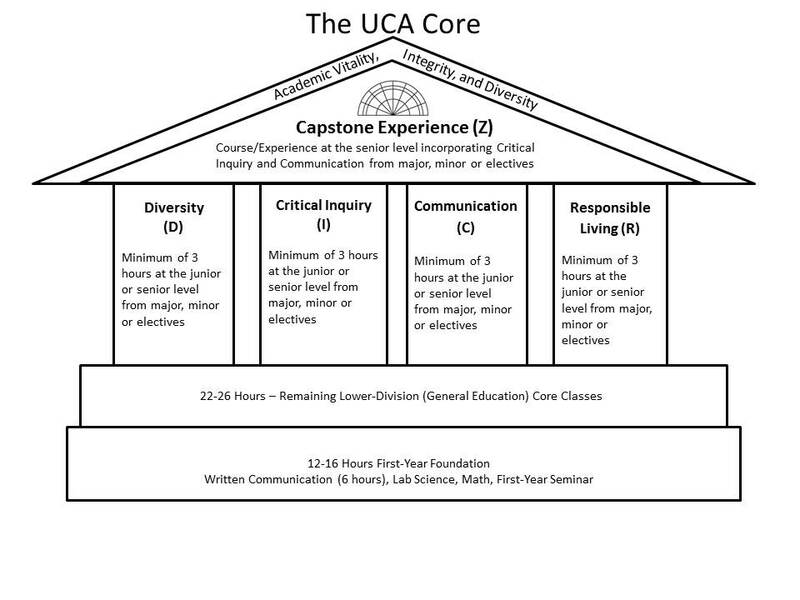 In addition, a capstone experience provides the integration of critical inquiry and effective communication.